We’ve included the term ‘family’ in our name for a few reasons. First, we cater to your entire family’s individual and collective needs and secondly, and we’ll treat you like family along the way. We follow a multi-visit approach to give you the best, most thorough care possible. Then, Dr. Downes will conduct a series of examinations such as a posture evaluation, muscle spasm and palpation tests, weight imbalance scans, and other condition-specific tests. 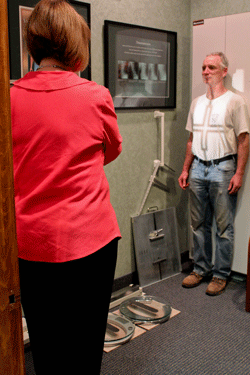 We also take X-rays when necessary to get the full scope of your health status. You can bring along any documents, X-rays or other scans you may have to help us understand your health condition. This first visit takes about 45 minutes and then it’s time to schedule the next time we’ll meet! To make the most of your time, you can fill out your New Patient Form ahead of time and fax it to us or bring it along to your appointment. Your normal visits are all about receiving care, sticking to what we think is best for you based on your needs. “I’ll adjust you, educate you and listen to you. And, we’ll always make sure to pay attention to your progress and make sure we’re staying on track!” Our signature system at Broadway Family Chiropractic is results oriented. We want you not only to be feeling better but also healing better! Regular visits are shorter and take around 5 to 15 minutes, depending on your in-office procedures for the day. Ready to feel better than you remember possible? Schedule an appointment today so we can get started!